A visit to the clinic on a holiday seems a bit unusual. But we went because our baby wasn’t in the right position. Well, the good news is, she’s back to being head down! Very good news! She’s doing quite well. She’s now 2586 grams, which is a bit bigger than normal. Everything is pretty much the same as last week, except she’s put on weight. Her kidneys and liver are now fully functional, and her sense of touch is now working well. Mostly all that’s left is to gain weight. Mom is now able to be more active. After the past week of relaxing and resting, she’s now been told to move a lot. If she keeps moving, the baby should settle down into her pelvis. So, lots of walking, exercise and she plans to do some cleaning around the apartment. The doctor also said that even if she feels abdominal pain, she should keep moving. Exercising and yoga will get her ready for the birth, which could happen within the next 2 or 3 weeks. The baby is as active as ever, as well. We got some really good ultrasound pictures this time. After being a little camera shy, she put on a great show this time. 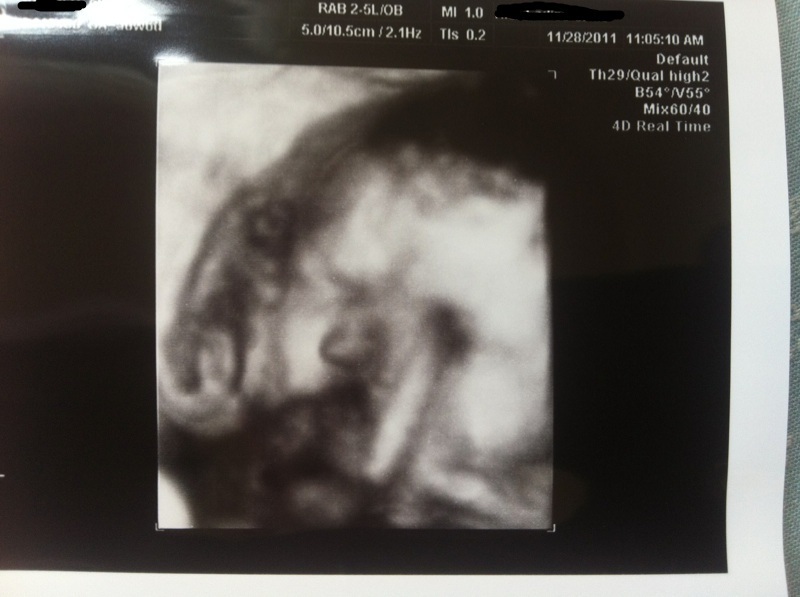 We have a wonderful 2D view of her face, as well as two 3D pictures. We got a bonus picture because she was being a clown. She made all of us laugh. It’s the third picture below. We couldn’t believe the luck in getting a picture like this! Good quality pictures this week. On the left is her face. On the right is her nose, mouth and chin. 3D picture of her face. She's looking really chubby! This is the most incredible picture we have of her. The doctor was very amused. She's sticking her tongue out! Great picture, isn’t it? Next appointment at the clinic is on the first day of week 37, which is full term! Talk about ups and downs. Last week, she was head down. Well, this week, she’s head up again! We’re now at the end of week 34, and coming into the homestretch. It’s quite possible she may be born in only 3 weeks! So, this was the last checkup of the year for the baby. We were supposed to be finding out about when she’ll be born. But the question is how she’ll be born. With her being in the breach position, it’s possible it’ll be a Caesarean section. If so, she’ll be born between January 17th and 23rd (week 38). If she turns around again, the birthdate is anyone’s guess. She’ll come when she’s ready. The baby is still healthy, in the average size range. However, she’s getting to be a bit bigger than the middle range of average. She’s now 2496 grams, which means she’s big enough to be born within the next week, and be a healthy, though small, newborn. However, her size is of a 37 week fetus, when she’s just about to start week 35. She’s getting big! She has quite the big belly, too. But nothing to be concerned about. Mom is experiencing plenty of growing pains, as well as enduring painful kicks and punches. Thanks to the baby’s incorrect position, she will now have to sleep on her left side for the next week. She has new orders from the doctor, and that is to take it easy. Rest and relax for the next week, and avoid doing anything active. That means no exercising, no long walking, no cleaning. Standing to cook is okay, but I’ll have to do all the shopping while she stays home. If all goes well, the baby will turn back to the correct birth position. However, due to her position, our next appointment will occur during the holidays. In fact, we go in on January 1st! Our plans for the New Year at her parents’ house in Saitama have been cancelled. We did get an ultrasound picture, but it didn’t turn out well. She was being camera shy. At 34 weeks and 6 days. This picture isn't the best. She was being difficult to photograph this week. This week was a bit unusual. 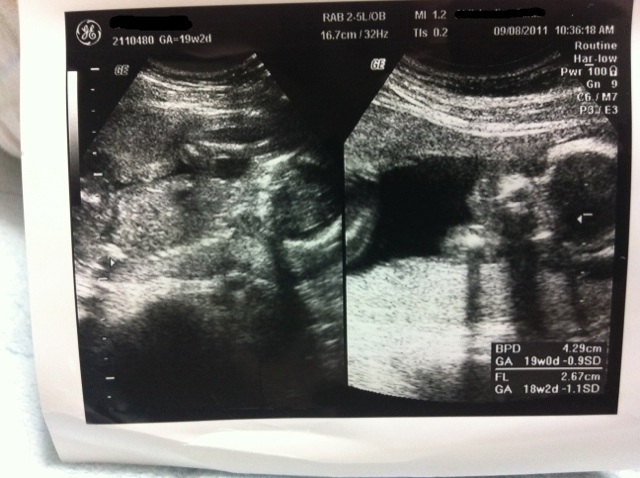 Because of the baby’s incorrect position last week, we had to go back to the clinic today to check on her position. We were told to come between 2 and 4 pm, but we got a call from the clinic at 10:50 am, and they asked us to come to the clinic by 11:30. We had only 40 minutes, and we were still in bed! I’ve been fighting a cold for the past week and just wanted to sleep, while my wife has trouble sleeping at night and wanted to sleep more. Well, we quickly got ready and left the apartment. We walked much faster than usual and arrived at the clinic at 11:31. Well, after about a 20 minute wait, she was called in to have the baby checked. It was only supposed to be a brief check, but I was later called to come in. I was slightly worried, actually. But it was just to see the ultrasound. The baby was back in the head down position! Great news! 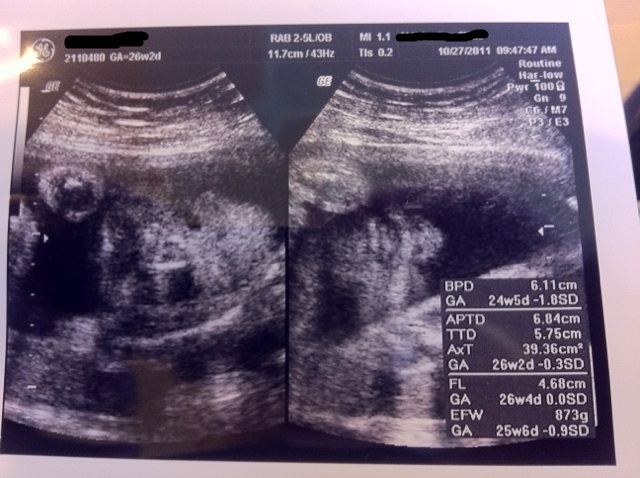 What we saw on the ultrasound was our healthy baby girl, only about a month away from birth. She’s still average size, slightly long legs and her nose looks a bit like mine. We also saw her open and close her mouth several times, as if she were chewing. She’s now 2102 grams, closing in on the minimum 2500 grams for full term birth. Her bones should be hardening, while her skull will remain flexible for the birth. She looks like a newborn baby by now. Mom is feeling the kicks and punches a lot these days. She can now sleep on either side, the doctor said. Her sleeping habits continue to be unusual, but that’s thanks to the baby keeping her awake. She has a hard time sitting up from bed, so needs to roll over and try push herself up. She easily gets out of breath from walking uphill. With only about a month to go, we’re getting pretty excited to see our baby girl. 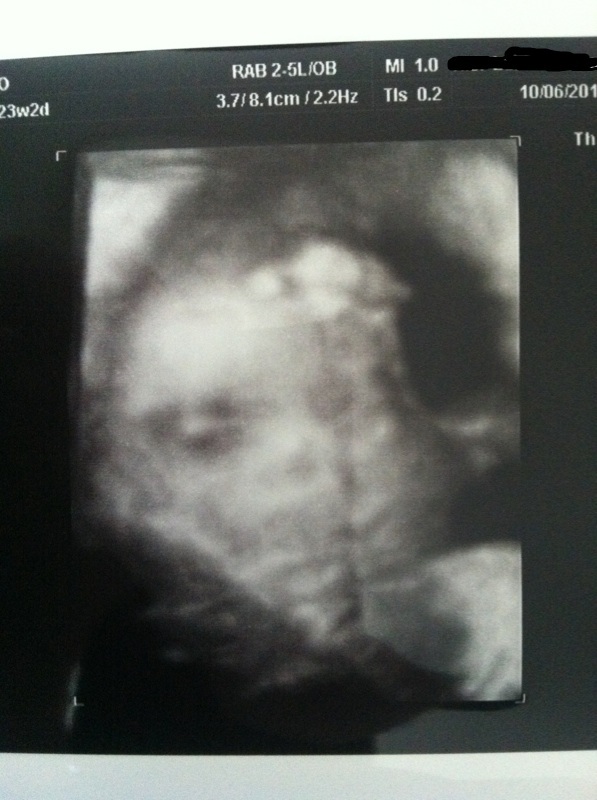 Here’s the ultrasound picture we received today. Unfortunately, we couldn’t get a good 4D picture, as her arms were obscuring her face. This is 33 weeks, 6 days. At the top is her full face, though both of her arms are slightly blocking the view. Below is another view of her chin, lips and nose. It’s only 6 weeks now until full term. 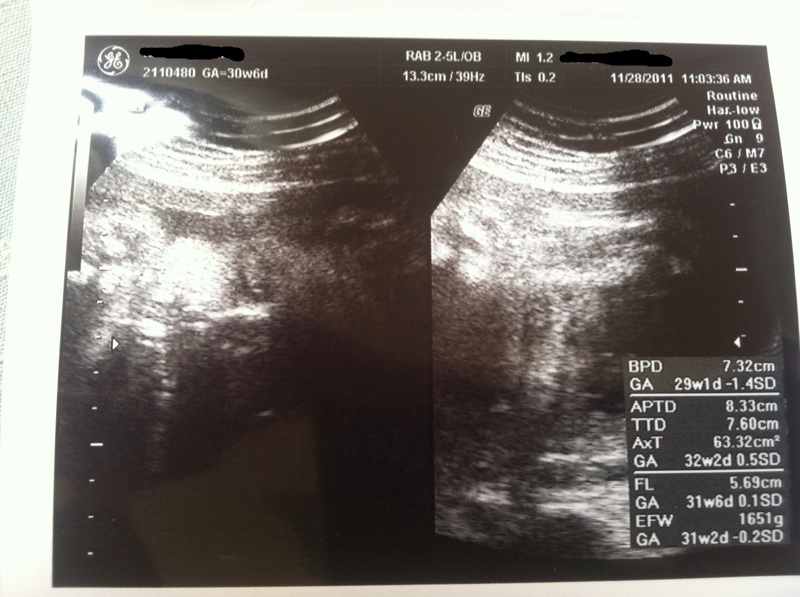 Today was the last day of week 30, and it included an ultrasound. What was different this time was that my wife’s mother was present during the ultrasound. The baby’s doing great. She’s back to the correct head down position, which is very important for the birth. She’s now 1651 grams. The doctor said that she’s slightly above average in weight, so she seems more like she’s at the end of 31 weeks. Her head is slightly below average size due to me. While her head isn’t actually small, the Caucasian head is longer and narrower than an Asian person’s head. Her heart is strong and healthy and her spine is straight. 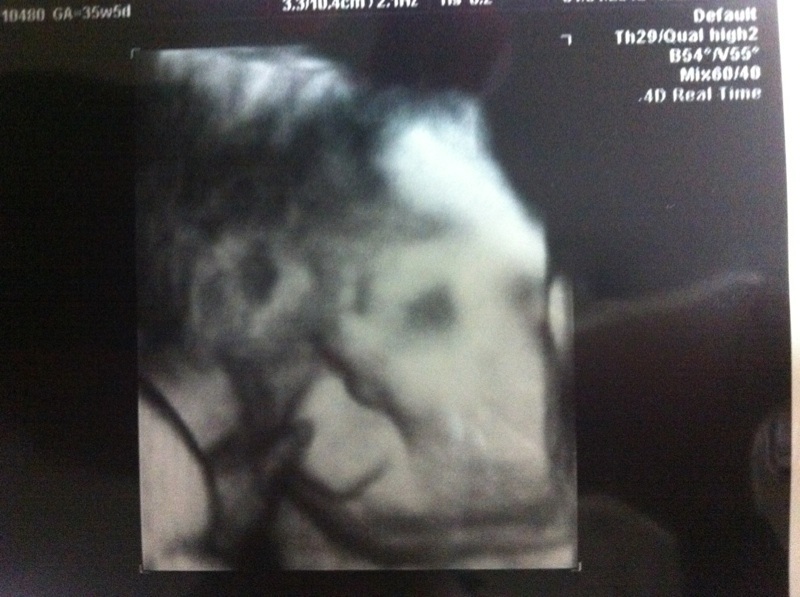 We got some great views of her face during the ultrasound, but the picture wasn’t taken at that time. Her eyesight is developing, though not so great yet. As always, she’s very active, and making it very uncomfortable for her mother. As for the mom, she’s feeling bad sometimes. She feels sick occasionally, and she often feels pain in the lower part of her abdomen. The doctor says this is normal, and should feel better if she takes a rest. Walking uphill is getting more and more difficult now. So, here’s what you’ve been waiting for, the pictures! On the left is the full face, while on the right is the chin, mouth and nose. She likes to hide behind her arm, which is on the right. On the left is the umbilical cord. The next visit to the clinic is in 2 weeks, but without ultrasound. Week 26 has been quite exciting, actually. 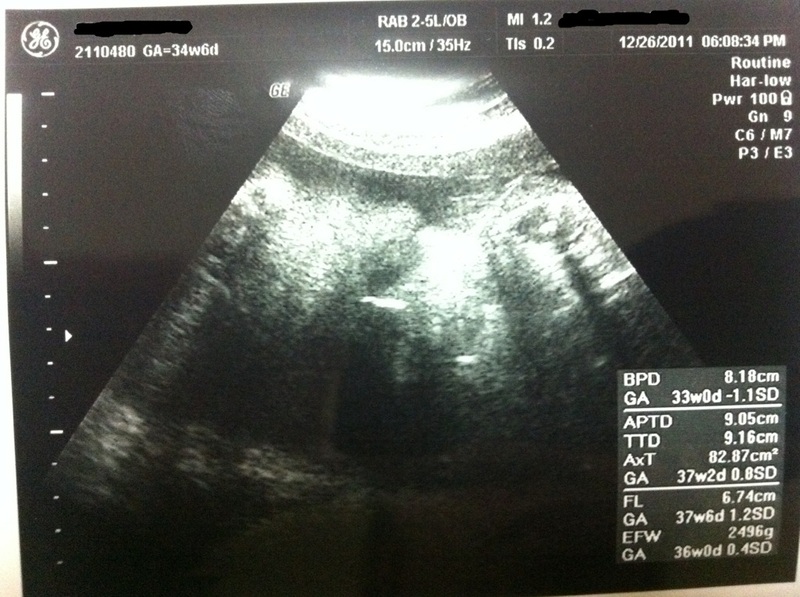 The visit to the clinic resulted in the best picture we have of our baby, as well as some very good news. So, how is the baby doing? She’s healthy, normal size, and not one problem at all. We were able to see her mouth moving, like chewing. At this point in her development, her ears are improving a lot, allowing her to possibly listen to our conversations. Her lungs are also practicing breathing. Amniotic fluid is going in and out of her lungs as they get ready for birth. Best of all, her position inside the uterus is head down. She’s in the correct position for birth. She’s now 873 grams, quickly approaching 1 kg. 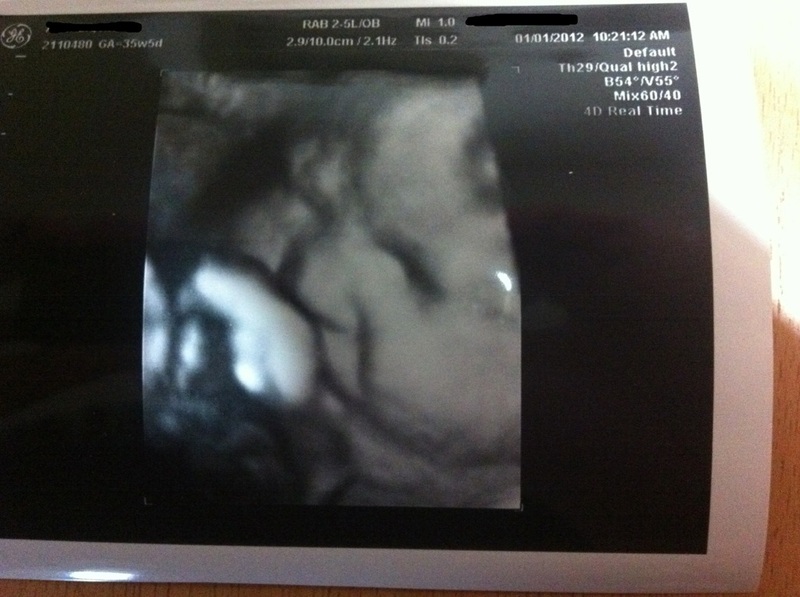 We got some pictures of her face, including an amazing 4D ultrasound picture. 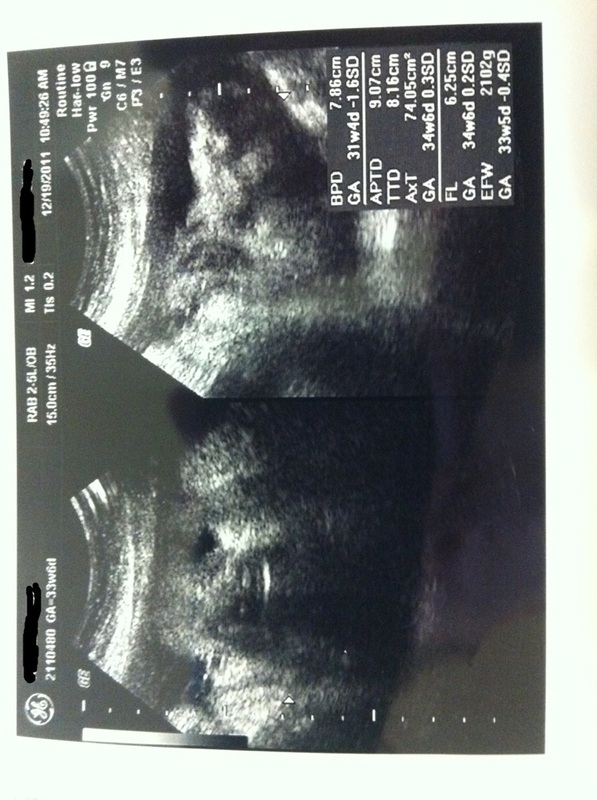 These regular ultrasound pictures show her face. On the left is her full face, while on the right is her chin, lips and nose. 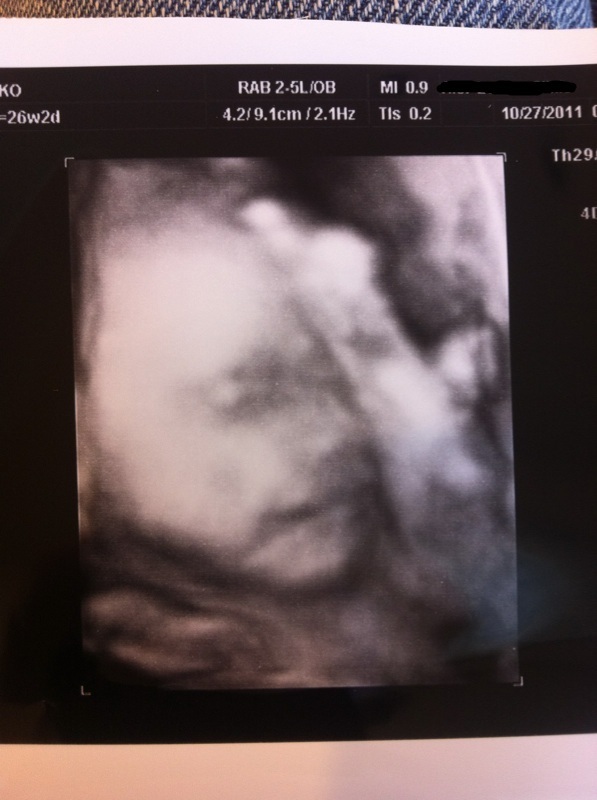 This is the clearest picture we have of her face so far. Incredibly clear! Mom is going through some discomfort as the second trimester nears the end. She can’t seem to eat as much, since the baby is pushing against her stomach. She’s feeling a bit sick at times, too. The baby is very active still, punching and kicking a lot. The final 3 months are going to seem long, I think. Discomfort is increasing, as well as boredom from being home all the time. But that’ll all change after birth. From this week, there will be clinic visits every 2 weeks, but ultrasound only once a month. On Thursday last week, we went to the clinic to have the regular checkup on the baby. The focus was a bit different this time. While we got to see the regular ultrasound, there was something extra this time. The doctor showed us the blood flow through her heart. He was doing this to check that her blood is flowing in the correct direction through her heart. Everything is normal! Also, he was checking her lips to make sure they’ve formed correctly. Through the ultrasound, the doctor determined that our baby is slightly smaller than average and her legs are slightly longer than average, but well within normal. 4 weeks before, we were told she was average weight and her legs were slightly shorter than average. Things sure can change quickly in only 4 weeks! She is now 565 grams. The blood vessels in her lungs are developing, getting ready to be able to breathe. She can hear quite a bit now, as well. This is the 4D picture. You can see her eye, nose and mouth, and her left arm is covering the left side of her face. This isn't the best picture I thought they could have given us, though. On the left is the full face picture. You can clearly see the eye, though the nose and mouth are a bit difficult to make out. Her left arm at the bottom is clear. The right-hand picture is the amazing one. You can very clearly see her chin, lips and nose, including her nostrils! How’s mom doing? She’s been doing a lot of exercising lately to keep in shape, both for her health and to prepare for the birth. The baby is kicking and punching hard, which is sometimes painful. To prevent dryness, she’s using lotion on her belly. This won’t prevent stretch marks, though. The next clinic visit is after only 3 weeks. That’s the start of the third trimester. After that, it’s every 2 weeks. Week 19, and it’s a….. This post is a few days late, but it’s still week 19. The last day of week 19. 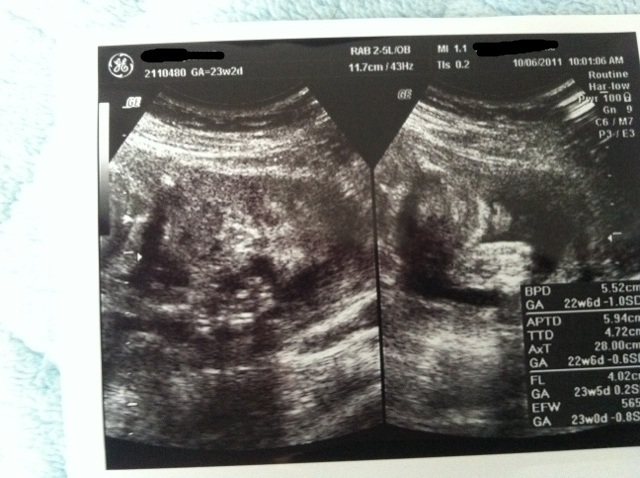 On Thursday, we went to the clinic for the first time in 4 weeks for an ultrasound and checkup on the baby. There were lots of questions for the doctor, and a reassurance that everything is going normally. 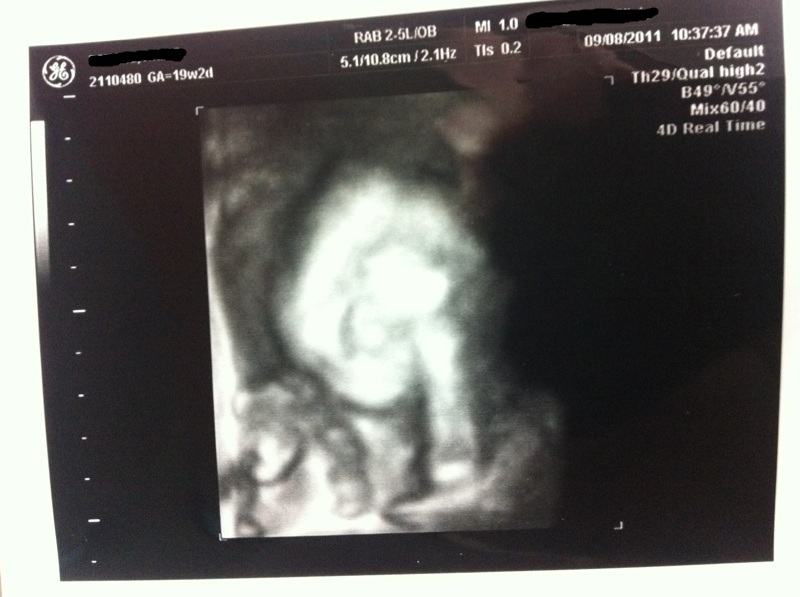 4D ultrasound at 19 weeks, 2 days. How’s the mom? Well, her morning sickness is pretty much gone, but it’s been replaced with lots of cramps. This is normal, though. It’s her round ligaments expanding. Also, she’s had some leg pains due to her vena cava being compressed by the baby in her back. This can lead to varicose veins and collecting of blood and swelling in the feet, ankles and legs. Her sleeping schedule is pretty unusual now, sleep during the day, awake at night. This is normal, according to the doctor. 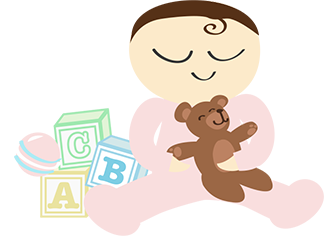 An interesting side effect of pregnancy is forgetfulness, which has been happening as well. Finally, some exciting news. 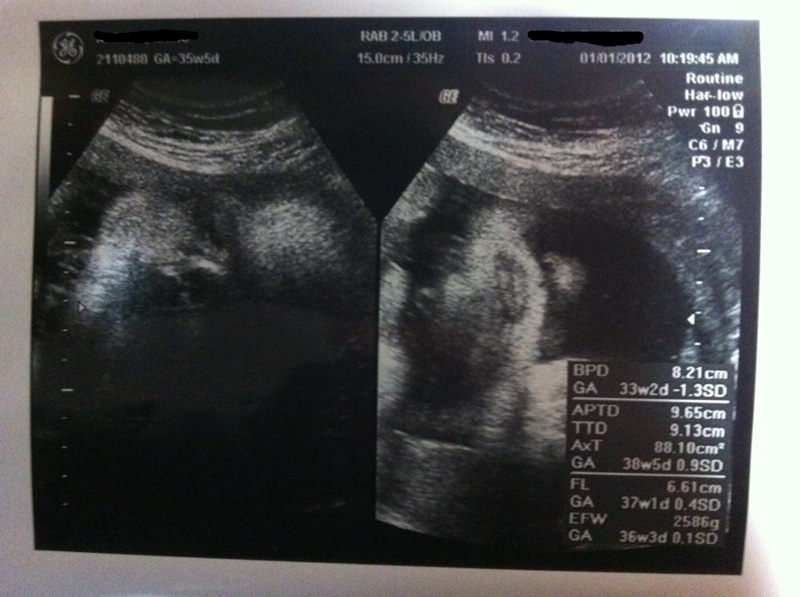 A month ago, the doctor told us what the gender was, but I didn’t announce it, because of the uncertainty at that time. But now, we are much more certain. We are having a girl!